My favorite blog is Home Is Where The Boat is. She shares the amazing gifts God has given her and we are all blessed for it. There's always something wonderful on her pages. 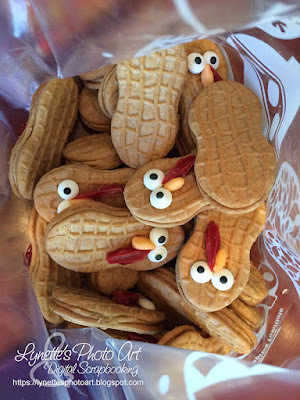 I fell in love with these cuties she shared and made them for Thanksgiving this year. Here is her post complete with tutorial. I hope you give them a try! I made 61 of these cuties. To give you an idea of how many a box of Nutter Butter cookies makes, this is two boxes and nearly two packages of Wilton eyes. I had eleven cookies left over that I didn't have enough eyes for. I made two changes to her directions. The beaks were to be orange covered sunflower seeds. Really? Well, nowhere I looked had ever heard of them. I had some orange marshmallow fondant left over, so I just molded beaks from that. Also she attached the "faces" with a kind of white frosting. I had edible glue that I use with the fondant and gumpaste, so I tried it. It works just perfectly, and since it's invisible, you don't have to worry about messy white frosting showing. I used a generous amount of the glue to be sure it would stick, given that the texture of the cookies is deep. That made the drying time longer. At half an hour nothing fell off, but I left them overnight to be sure they were dry. A real blessing to make this part ahead! I love how they looked in a bag! So fun! Then came fail#1. I had read that we can bake any boxed cake mix using only a 12 oz. can of ginger ale. Given my husband's quadruple bypass surgery a year ago, eliminating all the fat in the egg and oil was so exciting. I couldn't wait to try it. Never in my life have I had to throw out an entire batch of cupcakes. I have now. Returning to following the package directions (ingredients), I made four more boxes of extra moist triple chocolate cupcakes. I frosted them with the frosting recipe on the Hershey's Cocoa container, my always fav chocolate frosting. Fail #2. 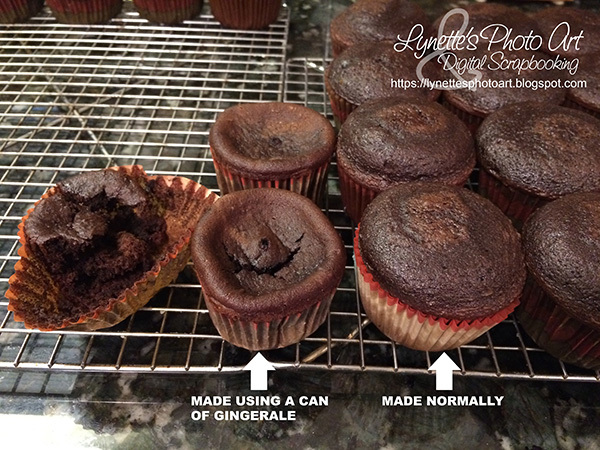 Just the gentle frosting of the tops was enough to cause some of the tops of the cupcakes to slide entirely off. 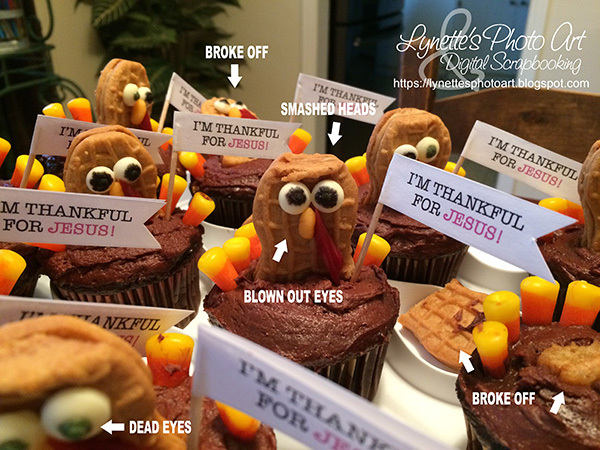 Others, the cupcake liners came loose. I won't be using extra moist box mixes on my cupcakes in the future. 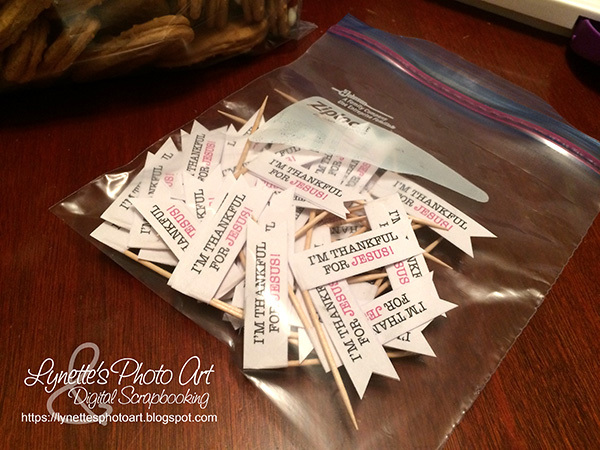 Made the happy flags for our turkeys to carry blessings to everyone I was giving them to. I saved some for my own family celebration. It's only the second time that all our grown family has been together for a holiday, and this time so much more special as I became a grandmother this year!!! Yep! High chair at my table!!! They live out of state, so this was big for me. 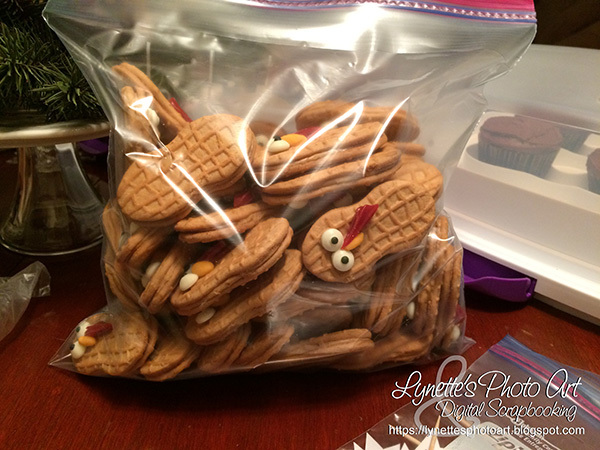 I delivered all my turkeys the day before and had just "tented" the lids on my carriers to keep ours clean until I would serve them with pumpkin pie a day later. Yep... fail#3 and such a huge one. As I excitedly pulled the lids off to serve them, the moisture from those not-such-a-blessing extra moist cupcakes had destroyed them all. 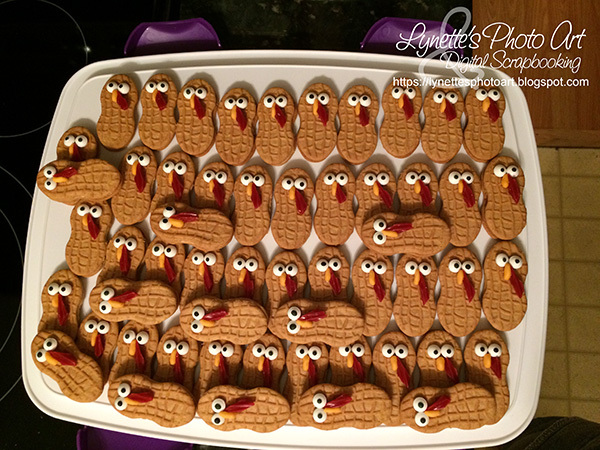 I had a bunch of "angry turkeys". Some had mashed heads making them glare. Some had gotten so soft they broke off at the cupcakes. Then it was a toss up between blown out eyes and glazed over dead eyes. Sigh. She warns not to put the candy corn "tail feathers" in the cupcake until you are ready to serve them as the frosting melts the candies. 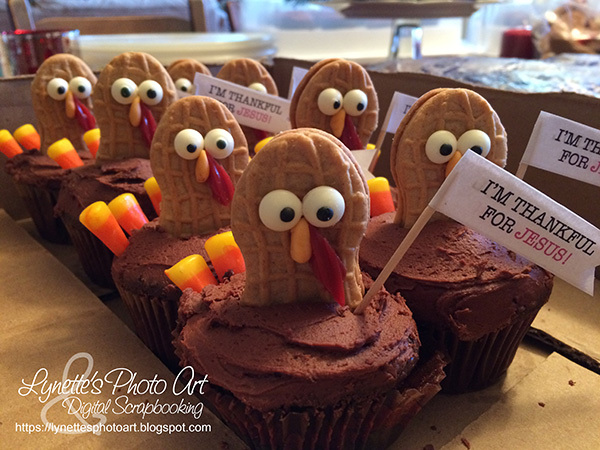 We went ahead and gave tails to all those ruined turkeys and set them out. I think I'm the only one who ate one. 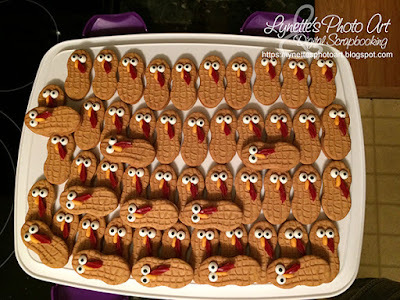 Happily, all the turkeys I gave away were perfect and such a happy bunch. I hope they helped people to be thankful and realize that all good things come to us from our loving Father God above, and took a moment to thank Him. I certainly learned some things and will know better next time. They were so very cute! 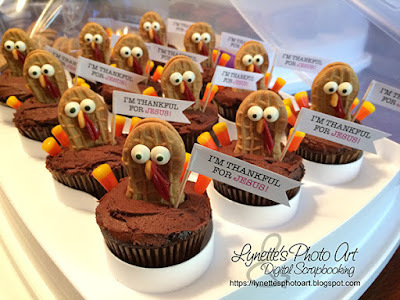 Thanks for stopping by and I hope you had a great Thanksgiving! God bless you and yours!